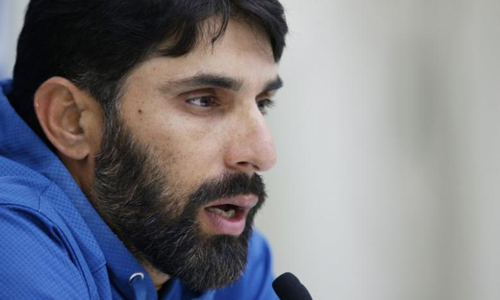 MELBOURNE – A strong fourth innings fightback that had nearly clinched a remarkable record run chase in the first test loss to Australia in Brisbane had given Pakistan the confidence they needed for the rest of the series, captain Misbah-ul-haq has said. Asad Shafiq scored a superb century and rallied the tail for 230 runs as the visitors reached 449 for eight before Mitchell Starc produced a superb bouncer that ended his 336-minute resistance. Until that point, the Australians had looked nervous in the field and the visitors increasingly confident of sealing victory, something they needed after losing 2-0 to New Zealand just before the first game. “The guys are relaxed and confident that they can perform well here,” Misbah told reporters at the Melbourne Cricket Ground on Sunday. “You can see that everybody’s spending a lot of time in the nets, working on the basics. They won’t leave anything behind before we get into the second test match. Misbah was reluctant to name his team’s final makeup, despite Steve Smith having earlier confirmed his side would be unchanged, though left-arm opening bowler Mohammad Amir had recovered well from knee and thigh injuries in Brisbane. Misbah added there was no point in concentrating on under pressure batsman Nic Maddinson, who has scored just five runs in his three innings since debut and was considered at risk with all-rounder Hilton Cartwright brought into the squad. “He’s quite young at international level but they’re believing in him,” Misbah said.